OTTAWA -- Refugee agencies and the Red Cross are racing to line up housing for thousands of Syrians in the coming weeks as the focus of the Liberal government's program shifts from refugees with private sponsors to those assisted by the government alone. Three military bases in Ontario and Quebec should be ready by the end of next week to provide essential services for government-assisted refugees, said Hossam Elsharkawi, associate vice president, international operations for the Canadian Red Cross. "If we need to grow that to larger, we will." So far, the bases haven't had to be used in part because privately sponsored refugees -- representing about 10,000 of the 25,000 Syrians the Liberals say they will bring to Canada by the end of February -- have groups arranging housing. Those refugees formed the majority of the first wave of resettlement. But with arrivals set to spool up in the remaining seven weeks of the program, especially those of government-assisted refugees, finding enough temporary housing has become an urgent issue. Over the course of a normal year, Canada takes in about 7,000 government-assisted refugees, sent to one of the 36 cities with agreements in place to provide support services paid for by the federal government. In many of these cities, organizations run residences that can handle a few hundred people at most for a few weeks while they search for more permanent housing. Government-assisted refugees often arrive in clusters, but having 15,000 of them coming in the space of three months is overwhelming. Regina usually receives about 215 government-assisted refugees a year but is preparing to handle 348 by the end of February. "It's not too much more, but in the span of two months we are getting almost double what we get in a year, " said Getachew Woldeyesus of the Regina Open Door Society. "The pressure is not the number but it is the time frame." Still, the extension of the original government deadline to resettle all 25,000 by the end of last year gave the group time to secure 300 apartments, thanks to the generosity of landlords and a lot of leg work. As of Jan. 6, 6,974 Syrians had arrived in Canada. Currently, the overflow in other cities has been managed by accommodating people in hotels or motels. Military bases are the option of last resort, said Debbie Douglas, executive director, Ontario Council of Agencies Serving Immigrants. "It's difficult to have folks come from one camp into another military setting," she said. Since the start of the program, military bases were eyed for housing needs, but neither the Defence Department nor the Immigration Department would elaborate Friday on the plan to use them. CFB Kingston and CFB Valcartier have always been at the top of the list, followed by Meaford, Petawawa, Trenton and Borden. "Due to the many factors influencing if and when a refugee will have to go to an (interim lodging site), it is premature to speculate on the scale of possible operations," Faith St. John, a spokesperson for the Immigration Department wrote in an e-mail. 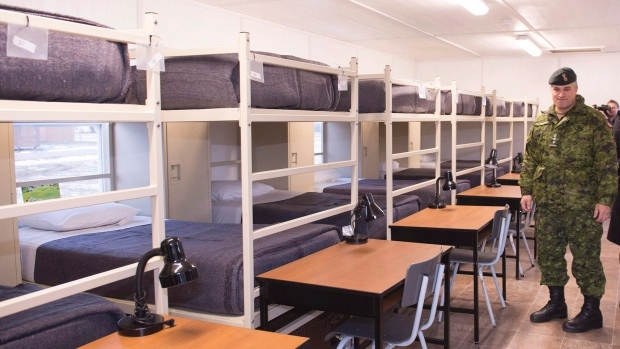 Refugee agencies currently provide daily updates to the government on how many beds they have and some of the resettlement funding already allocated by the Liberals has gone to securing more space to avoid the use of bases. A national shortage of affordable housing, especially in major cities, will make securing long-term housing for all refugees a challenge. Several real estate firms have offered apartments, including Calgary-based Mainstreet Equities. It initially said it would provide up to 200 discounted apartments but is now looking at raising that number, said company president Bob Dhillon. Prior to the end of 2015, there had been little interest in his offer but in recent days his office has been fielding dozens of calls. "When somebody newly arrives into Canada, you can make their lives by offering a little assistance," he said. "That first home is everything."